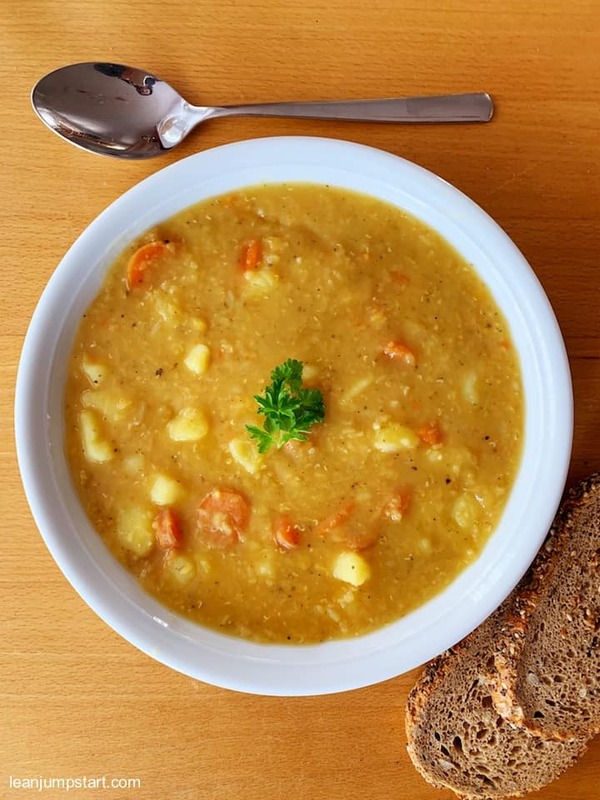 On the web, you’ll find many recipes for making fiber-rich and filling soups based on legumes. 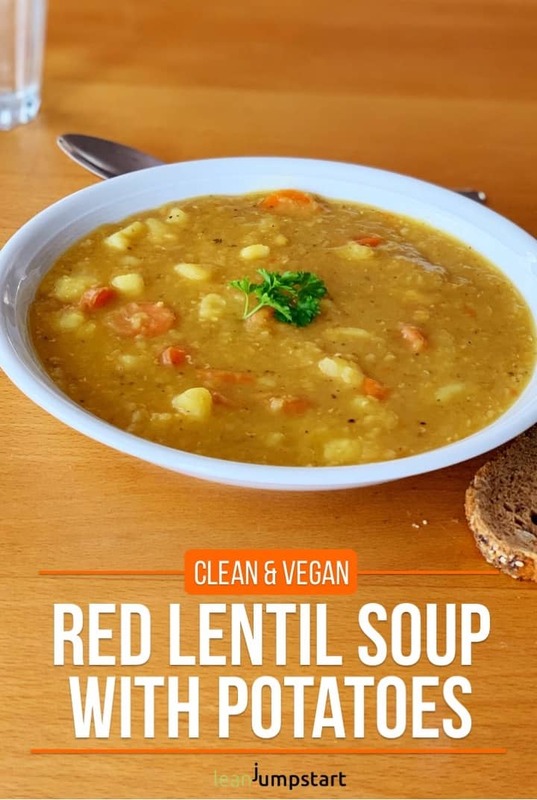 The following simple, vegan red lentil soup recipe is one I cook at least two times per month. It can be offered as a starter or a wholesome main dish. This flavorful soup is ready in under 30 minutes, budget-friendly and most of the ingredients are staples that I have in my pantry anyway. 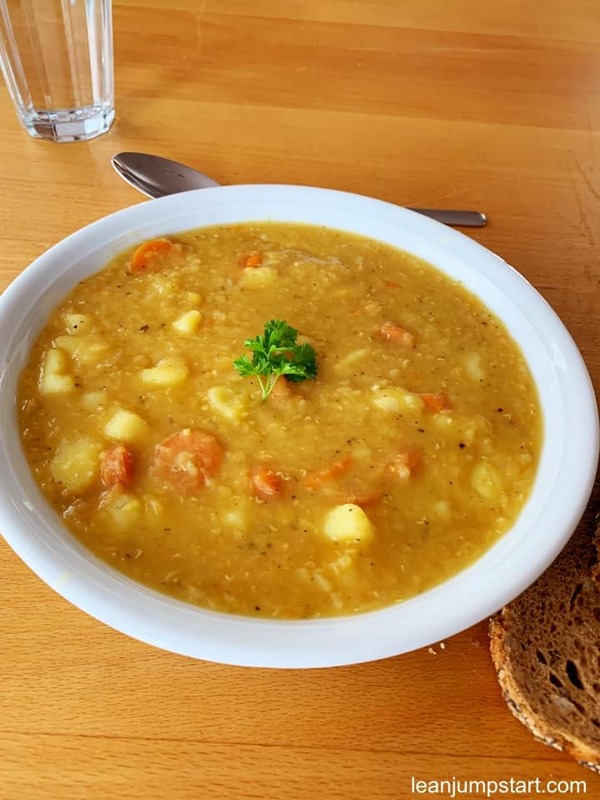 You just need some potatoes, a carrot, an onion, vegetable broth and of course red lentils. I love to combine it with some whole grain bread for a quick and wholesome lunch or weeknight dinner. Consuming them together with grains results in a favorable combination of amino acids, which provides your body with powerful nutrition. Seven of the nine essential amino acids are found in lentils, two are missing. If you eat a whole grain food with your lentil dish, you can balance this deficit. Whole grains and other cereal products contain these lacking amino acids in adequate amounts. Don’t miss my short video (1:10 Min) below where I show how you can easily cook this clean eating soup. Enjoy! For some variation, you could replace regular potatoes with sweet potatoes and season with cayenne pepper. An Asian touch you get when you add some coconut milk and season your dish with curry powder. If you don’t like chunky soups you might want to use an immersion blender after the soup is cooked and create a creamy bowl of goodness. If you wish an oil-free soup for a whole food plant based diet (WFPB) make sure to add at least some coconut milk to the soup. That way you can help maximize the absorption of carotenoid nutrients in carrots. When it comes to ease of cooking then red lentils are my absolute favorite legumes. As they are already peeled, these legumes no longer need to be soaked and cook quickly. They are also easy to digest, which is particularly beneficial for people with a weak digestive system. Although red lentils are not as nutritious as unpeeled lentils, they are good sources of fiber and protein. These traditional ingredients have a mild taste of their own. With their floury consistency, they are not only a perfect ingredient for creamy soups but also for stews, purees, salads, dals, homemade spreads and, red lentil pasta recipes. In short, they are super flexible for many nutrient-dense recipes.